1Digital-identity issues are particularly acute on social networks. 2While everyone knows what a social network is, the term nevertheless covers a very wide variety of websites, which range from content-based networks (music networks, for example) to professional networks, not forgetting the inescapable giants that Twitter and Facebook have become. 3The resonance of the identity issue varies from network to network. The question of anonymity, for example, is absent on professional social networks where users showcase their CVs. 4Just as Google’s promise of indexing all available information and knowledge still leaves some daydreaming, Facebook is also in search of its own Utopia. This entails creating a complete map of the connected world and visualising the interrelationships between everyone on the planet. Created in 2004, Facebook had 70 million members in 2007. Shortly before being floated on the stock market, Facebook reported that it had over 900 million active users1. 5The International Telecommunication Union estimated that there were 2 billion Internet users in the world at the end of 2010. Though other networks exist and in some parts of the world represent a sizeable slice of the market2, the fact that nearly half of the planet’s Internet users have a Facebook account indicates just how far others are lagging behind in terms of offering a genuinely competitive alternative. “invisible audiences”: most of the audiences and recipients of my messages are absent when I write them. 7These four properties give rise to radically altered enunciative and discursive situations, and these situations occupy a different space and time than those in which our offline relationships are played out. And we need to learn to navigate this space and time if we wish to avoid more cases of employees being fired for badmouthing their boss on Facebook, or for posting photos of themselves on the beach when they were supposed to be tucked up in bed after calling in sick3. document integrity, or the fact that all our document traces are altered, transformed and edited by us (ego), our friends, family and colleagues (inter), or other people (alter). Ultimately, once this permanent documentation is remixed and displayed by search engines, our “document integrity” can either be totally assured or, on the contrary, utterly escape our control. The latter is the more likely outcome. 5 These quotations are taken from the 2005 Facebook privacy settings. No personal information that you submit to The Facebook will be available to any user of the Web Site who does not belong to at least one of the groups specified by you in your privacy settings5. 11At this stage, only “you and your mates” could view your data. 12In 2006, Facebook’s default privacy settings were extended to embrace the decidedly hazy notion of “other reasonable community limitations”, which Facebook alone could determine and decree. 13In 2007 came the possibility of profile searches, which made most user data accessible via an internal search engine. This was the default option unless users explicitly modified their privacy settings. 14 In 2009, Facebook was opened up to search engines, again by default. This was a radical turning point, enabling anyone using a search engine to find information which, though already very accessible, had previously been available only to those signed up to Facebook. Information set to “everyone” is publicly available information, may be accessed by everyone on the Internet (including people not logged into Facebook), is subject to indexing by third-party search engines, may be associated with you outside of Facebook (such as when you visit other sites on the Internet), and may be imported and exported by us and others without privacy limitations. The default privacy setting for certain types of information you post on Facebook is set to “everyone”. You can review and change the default settings in your privacy settings. Certain categories of information such as your name, profile photo, list of friends and pages you are a fan of, gender, geographic region, and networks you belong to are considered publicly available to everyone, including Facebook-enhanced applications, and therefore do not have privacy settings. 17Our identity traces are granular: fragmented and piecemeal, underexposed yet overdocumented. A status update here, a commentary there. My opinion on a book sold by Amazon, a post published on my blog, a photo at a party I find myself “tagged” in, etc. Search engines now consider even the tiniest, purportedly private, online activities as “documents” in their own right, or jigsaw pieces in the oeuvre that I leave behind me as my digital footprint. What’s more, this jigsaw puzzle will be all the easier to piece together retrospectively now that users are encouraged or even obliged to use their real names rather than pseudonyms, as has recently become the case on Facebook and Google+7. 18These identity fragments, and the means by which they are accessed, are naturally porous. The different sites where we publish parts of our digital identity are increasingly, and ever more systematically, interconnected. Once again, Google and Facebook have led the way here. Let’s take the example of a video posted on YouTube (which was bought up by Google). If I am logged onto YouTube through Gmail, Google will add all the videos I have on my profile to its existing empirical knowledge of what my interests are. At the same time, I will be encouraged to post and/or announce this same video on my Facebook wall or on the micro-blogging site Twitter. Though I can only very partially control these interconnections, they satisfy my desire to “publicise” the video and garner as much airtime as possible. 19Our digital identities are like water droplets percolating through sand. The movement of these droplets and how they are collated and aggregated must not be left to major online corporations to use as they please. I should always be able to decide what information I want to collate, and whether I want the little rivulet that is my digital identity to merge into the wider rivers that are social networks, which themselves pour into the vast oceans that are search engines. Thanks to the continued pressure of organisations and associations that work to protect digital rights and freedoms, it is now easy enough to retrieve all the documents and information stored on your Facebook account (the list of your friends, the history of your status updates since you signed up, your photos, etc.). In the same way, many major Web actors now systematically offer settings that make the nature of the data and information stored about us more transparent. Nevertheless, these actors alone command a synoptic view of our interconnected behaviours within their service ecosystems or those of affiliated third parties. 20In the fields of documentation, information science and librarianship, metadata refers to information that is provided by specialists to better describe a digital document or resource. This process is now sometimes automated. Metadata is thus information about information. 21Each time we enter a search online, update our status or write on our “wall”, we provide search engines and social networks – most often unwillingly or unwittingly – with a veritable mine of information about who we are and how we behave online. Ultimately, each click, action or behaviour acts as metadata in a sort of global panopticon. 22The genius of search engines and social networks has been to turn the metadata modus operandi into an almost unconscious (or subconscious) process, and to make it the indispensable and non-negotiable prerequisite for any collaborative activity online, above and beyond any vague concern for online expression itself. They have thereby bound all online participation or expression to declarative logics that are not necessarily connected to participation and expression in and of themselves. 1 Julien L., “Facebook compte plus de 900 millions d’utilisateurs actifs”, Numerama, 24 April 2012, http://www.numerama.com/magazine/22423-facebook-compteplus-de-900-millions-d-utilisateurs-actifs.html, accessed 30 October 2012. At the end of September 2012, Facebook published a press release announcing that it now had over a billion users, affordance.info, 9 October 2012, http://affordance.typepad.com/mon_weblog/2012/10/facebook-1-milliard.html. 2 Guillaume Bonvoisin, “Réseaux sociaux dans le monde 2012 : quelle est la situation ?”, CNET France, 11 June 2012, http://www.cnetfrance.fr/news/reseaux-sociauxdans-le-monde-2012-quelle-est-la-situation-39772762.htm, accessed 30 October 2012. 3 Christelle Dardant, “Incertitudes autour de la jurisprudence ‘Licenciements Facebook’”, Institut de recherche et d’études en droit de l’information et de la communication (IREDIC), 31 January 2012, http://junon.univ-cezanne.fr/u3iredic/?p=8378, accessed 30 October 2012. 4 A conservative estimate suggests that the site holds at least 650 teraoctets of personal data, 65 times that held by the United States Library of Congress. See Olivier Ertzscheid, “650 téra-octets de données personnelles, et moi, et moi, et moi”, affordance.info, 14 November 2010, http://affordance.typepad.com/mon_weblog/2010/11/recuperation-donnees-personnelles-facebook.html, accessed 30 October 2012. 7 See in particular Danah Boyd, “Google plus, la dictature des vrais noms”, Owni, 8 August 2011, http://owni.fr/2011/08/08/google-plus-dictature-vrais-noms-anonymatidentite/, and Nicolas Perrier, “Facebook vous demande de dénoncer vos amis à pseudonyme …”, nikopik, 6 July 2012, http://www.nikopik.com/2012/07/facebook-vous-demande-de-denoncer-vos-amis-a-pseudonyme.html, accessed 30 October 2012. ERTZSCHEID, Olivier. 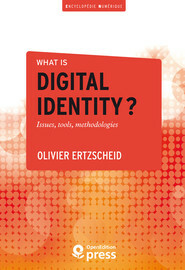 Social networks and public spaces In : What is digital identity? Issues, tools, methodologies [en ligne]. Marseille : OpenEdition Press, 2016 (généré le 25 avril 2019). Disponible sur Internet : <http://books.openedition.org/oep/1381?mobile=1>. ISBN : 9782821855793. DOI : 10.4000/books.oep.1381. Ertzscheid, Olivier. “Social networks and public spaces”. What is digital identity? Issues, tools, methodologies. By Ertzscheid. Marseille : OpenEdition Press, 2016. Web. <http://books.openedition.org/oep/1381?mobile=1>.